Selecting the correct trailer - When fitting a truck mounted forklift to a trailer (or truck) it vital that the weight distribution is checked. 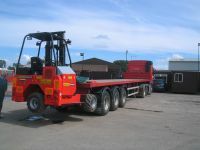 We can offer advise on selecting the right trailer or truck for your application. Following on from this we can carry out the necessary weight distribution calculations to make sure the forklift and vehicle combination are the perfect match.